Figure 1. Research staff scan Pelican Valley, looking for wolves and bison. Figure 2. 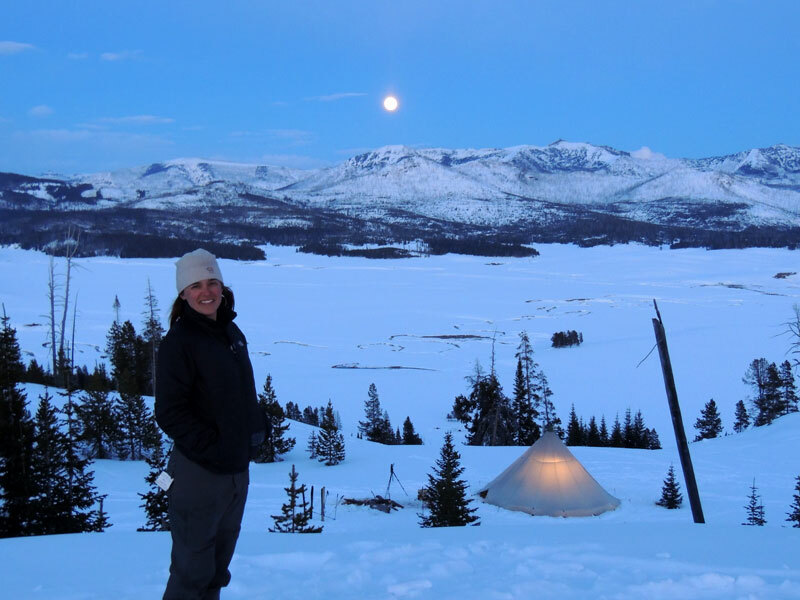 Aimee Tallian poses in front of Pelican Valley winter base camp, where she and other members of her crew study wolf-bison interactions. 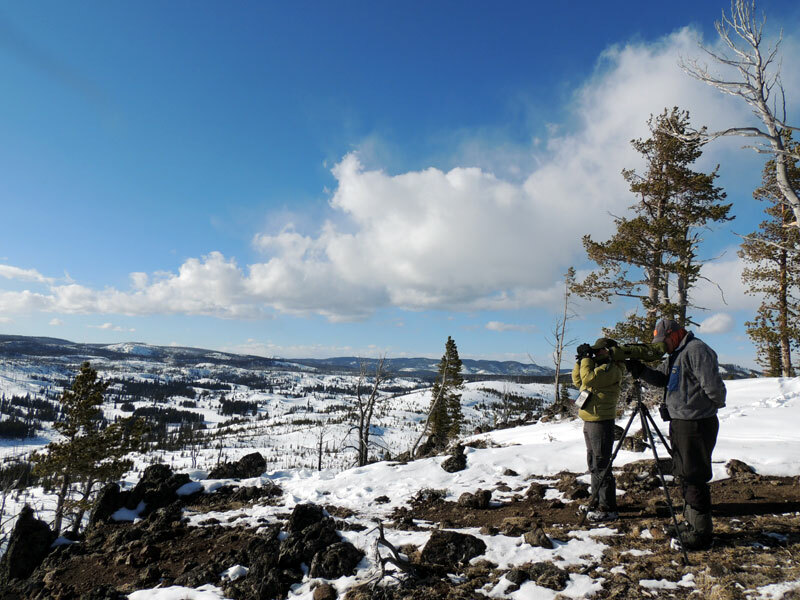 Wolves were reintroduced to YNP in 1996/1997 and park researchers and managers are still trying to understand how their presence impacts the ecosystem. Wolves primarily prey on elk in Yellowstone; however, predation on bison has slowly started to increase in recent years. What we know about how wolves hunt bison and what impacts wolves have had on how bison use their environment is still limited. The objective of this study is to better understand the behavioral interactions of wolves and bison. Since 1999, researchers have been collecting data on how wolves hunt bison in YNP. We will use this data to understand how wolf pack size, bison herd size and environmental conditions affect wolves' ability to successfully hunt bison, and whether wolves have affected the number of bison wintering in fringe habitat in the park. 1) The ability of group hunting predators to capture prey often peaks at small group sizes because hunters in large groups hold back. In our first analysis we tested how this pattern changed when predators attacked hard-to-catch prey. We found that peak capture success shifted from small to large group sizes when wolves switched from elk to more formidable prey, bison. This result is consistent with the idea that large groups are more cooperative when hunting more difficult prey. 2) Prey may benefit in many ways when living in groups. Our second analysis tested whether large prey species (bison) benefit from individual dilution of risk and aggressive group defensive behaviour when hunted by non-ambush predators (wolves). We found that anti-predator defensive tactics, such as charging, approaching, or standing and facing a predator, are important for mitigating predation risk and are more likely to be employed as bison group size increases, demonstrating an added benefit to group living. Additionally, when bison are hunted by wolves, the anti-predator benefit of risk dilution was only realized with larger groups. The presence of vulnerable prey increased with group size, leading to a rise in predation risk until the increased use of anti-predator defenses outweighed that benefit. These results are consistent with the idea that large prey form groups in order to better defend themselves from predation. 1) How landscape characteristics and environmental conditions in winter determine wolf predation risk for bison. In Yellowstone's Pelican Valley, one of our main study areas, high winds and geothermal activity produce patches of snow-free ground which wintering bison use for forage and safety. We think that the size and density of these snow-free patches will define risky/safe areas (small patch size limits the amount of defensible space available to effectively maneuver against wolves) and that predation risk will be greater in years when the winters are more severe. 2) Whether the reintroduction of wolves in YNP has limited winter use of Yellowstone's interior Pelican Valley by bison. Bison have historically wintered in this valley; however, the number of bison utilizing this area in the winter has declined in recent years. Elk are the main prey for wolves in YNP, but Pelican Valley offers no alternative prey species for the resident wolf pack at this time of year. Additionally, bison are more susceptible to predation in winter, and may be particularly sensitive to predation in this area. We think that increased predation pressure by wolves has, in part, limited bison winter use of this valley.